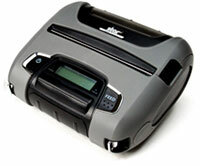 Star has announced new thermal labels certified to work with the SM-T400i portable Bluetooth printer. As the widest format portable Bluetooth printer in Star’s “i” Series, the SM-T400i is a rugged four inch portable Bluetooth printer with a wide 104mm printable area, ideal for data filled service reports, delivery notes or law enforcement citations. The SM-T400i includes both transmissive and reflective sensors enabling label printing. The SM-T400i is an Apple MFi certified, portable receipt and label printer which can be use with the iPod Touch, iPhone and iPad. With operating system support for iOS, Android and Windows, the SM-T400i also boasts a configurable Eco-Friendly Auto Power Down mode. Dust protected and splash-proof resistant (IP54 Certified), the SM-T400i is a welcomed option for any environment. In addition to a print speed of 80mm per second, Star’s SM-T400i prints at a resolution of 203 DPI and comes with “Drop-In and Print” easy paper loading as well as an LCD display. It ships complete with an AC charger, battery pack, serial cable, sample roll, belt clip and set-up sheet.